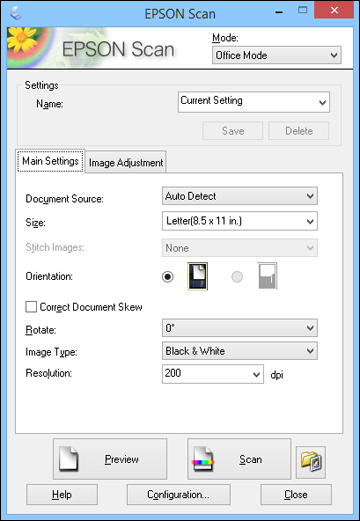 You can start the Epson Scan program to select scan settings, scan, and save the scanned image to a file. Windows 8.x: Navigate to the Apps screen and select EPSON Scan under EPSON or EPSON Software. Windows (other versions): Click or Start, and select All Programs or Programs. Select EPSON or EPSON Software and click EPSON Scan. OS X: Open the Applications folder, open the Epson Software folder, and double-click the EPSON Scan icon.